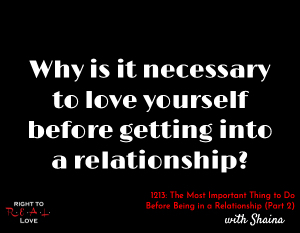 In this episode, Yahnathan continues his discussion with Shaina of the Sisterly Love Podcast by addressing the question: Why is it necessary to love yourself before getting into a relationship? Why is it necessary to love yourself before getting into a relationship? Why you must invest in truly knowing and loving yourself. How to determine whether or not your truly love yourself. Shaina opens up about some of the trust issues she developed in her childhood.